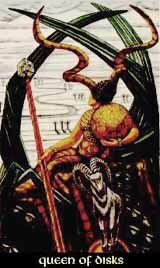 The Queen of Disks is the mother of her element, the water in the earth, which makes her the perfect mother, conforming and emotional as for the water and stable and reliable as for the Earth. The Queen of Disks is kind and tender, friendly and good-hearted, she has fine instincts and intuitions. She is strong and sensitive, protects her house and family and cares as well for emotional and material well-being. She is calm and practicable and can be a good, industrious worker. Beneath the calm surface, the Queen of Disks can tend to lust and debauchery, fond of intoxicating stimulants, but she keeps it hidden. At the best, she will know that the dose makes the poison - at the bad, she won't. On the dark side, the Queen of Disks lacks both the qualities of Air and Water, therefore she can get foolish and rather unintelligent, without pride and spirit, easily getting in needless dependence and being too weak to free herself - or even worse: not even trying to get free and independent.